International rally against US/NATO military bases held in Dublin | Fight Back! 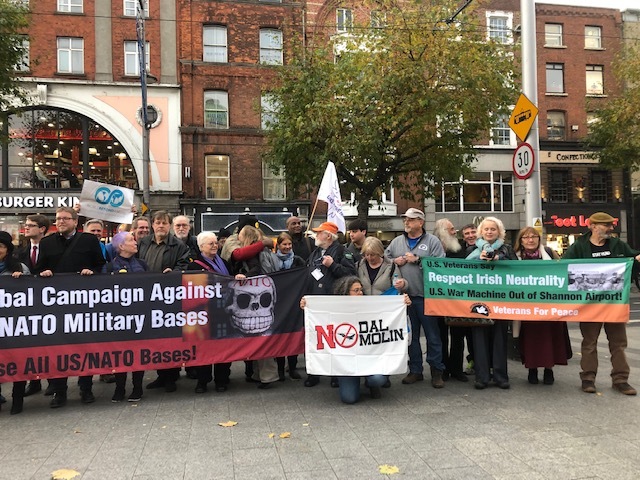 Dublin, Ireland - The International Conference Against US/NATO Military Bases began in Dublin, Ireland November 16, with a demonstration in front of the General Post Office, site of the 1916 Easter Uprising. There are now close to 1000 US/NATO military bases in 170 countries. The cost to U.S. taxpayers for the military bases is near to $156 billion per year. Dr. Aleida Guevara, a member of the Cuban National Assembly and daughter of Che Guevara, spoke about the illegal U.S. occupation of Guantanamo naval base in Cuba. “We led a successful campaign to stop the building of a US/NATO base in the Czech Republic,” said Milan Krajca of the Czech Peace Movement. The more than 300 peace activists at the conference heard about plans for protests against the NATO Summit on its 70th anniversary. On Saturday, March 30, 2019, there will be a demonstration in Washington D.C. led by the United National Antiwar Coalition. On April 4, there will be an action led by Black Alliance for Peace and supported by many others. All participants and speakers at the Dublin rally opposed and denounced the US/NATO wars in Yugoslavia, Iraq, Afghanistan, Libya, Syria and elsewhere. In a world ravaged US/NATO violence and militarism, this conference could not come at a better time.